Sony Ericsson has launched a new channel on the Android Market specifically for Sony Ericsson handset owners. 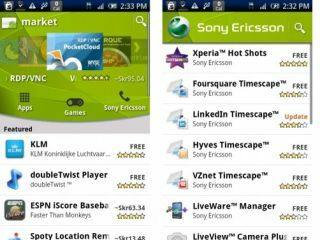 Announced in a post on the company's blog, the Android Market channel is a place where all the Sony Ericsson specific apps and plug ins will be highlighted, as well as the company offering recommendations and marketing space for their company partners. There will also be occasional special offers and exclusive games for Sony Ericsson customers. Sony Ericsson is the first phone manufacturer to stake a claim on a specific bit of the Android Market, but no doubt others will follow where it leads. The new channel has displaced the 'My Apps' option in the Market, which means you'll now have to hit the menu button to see your existing apps. Most Sony Ericsson Android handsets should see the channel from today, although the company does warn that it's operator dependant, so some may not get it at all.